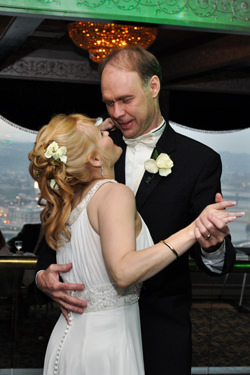 On Friday June 4th 2010 we were at The LeMont on Mount Washington. The event was a wedding reception for Steve and Cheryl Zavacky. 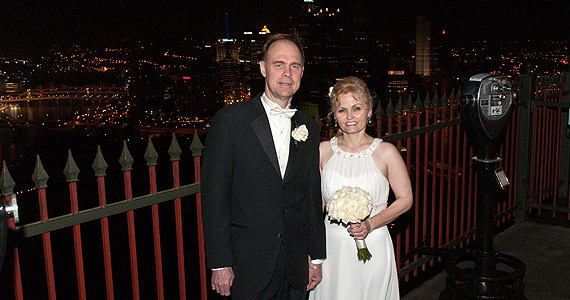 Steve and Cheryl were married at 4:00 PM at The Pleasant Hills Community Presbyterian Church. Guests began arriving at The LeMont at 5:30 PM were they enjoyed cocktails and appetizers. At 6:30 PM we introduced the bridal party and bride & groom to “This Will Be An Everlasting Love” by Natalie Cole. After the introductions, guests enjoyed an 8 minute photo montage featuring Cheryl and Steve. Dinner was prepared by the culinary staff at The LeMont and was served sit down style. Following dinner, Steve and Cheryl cut their wedding cake to “How Sweet It Is” by James Taylor. We then invited the newlyweds to share in their first dance together as husband and wife to “Love Is Here To Stay” by Frank Sinatra. Cheryl then danced with her brother Mr. Jeff Carroll, while Steve danced with his mother Mrs. Beverly Zavacky to “Time Of Your Life” by Paul Anka. Throughout the reminder of the evening guests danced to music by Gladys Night, Aretha Franklin, The Temptations, B52’s, and more. At 11:30 PM we invited Steve and Cheryl, along with their guests to share in the last dance of the evening to “Unforgettable” by Nat King Cole and Natalie Cole.